There are many different ideas to what a "Home Theater" should be. To one person it may mean a 4K projector with a robust 150" screen, every possible gadget run by a single remote, and a multi-speaker surround system that would make George Lucas envious. To another it may be a 40" panel TV hung above the fireplace matched with an aesthetically pleasing, yet rich sounding, sound bar. Whatever you envision, let our professional install experts design and build the theater of your dreams all at a competitive, affordable price. And since they are our own employees your satisfaction is guaranteed. Our initial consultation is only $99.95 and will be credited toward the cost of your install (some limitations apply). What do you have to lose? Let us do all the heavy lifting ... all you will have to do is sit back and enjoy your new home theater! Here is a small sampling of the services we offer at unbeatable prices. Pedestal is assembled and installed on TV. Build newly purchased TV stand or console (some stands require additional charge). Place TV on stand and perform initial set-up. * We will plug in an audio cord from an existing audio system to the new TV. Setting up a surround Sound system can be done at an additional charge. *** Note that we remove or move old TV's on "one for one" basis. R.C. Willey believes that great service does not stop at the cashier, but it extends past the time of purchase. 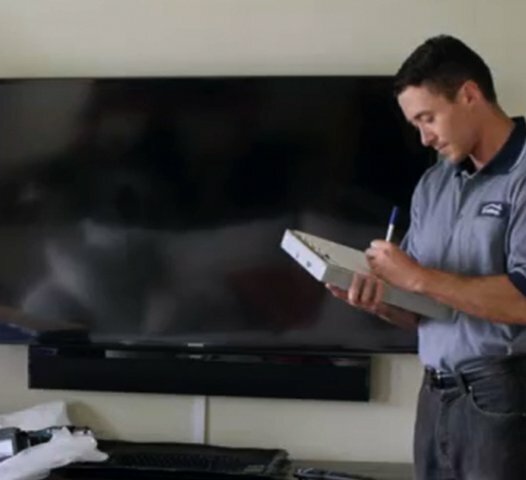 As part of that commitment we offer our Deluxe Delivery service that removes the hassle of figuring out how to get your new TV home and takes the guess work out of setting it up correctly to work with all your components. This service is performed by our same professional install team that design and build complete large, complicated, home theater audio/video systems. So you can be assured your TV will be setup correctly. And it is "FREE" if you are a "5 STAR" member! Didn't Purchase Your TV from R.C. Willey? Did you purchase your TV or components from somewhere other than R.C. Willey...maybe a warehouse club? No problem. Our goal is to make everyone a customer of ours for life. We have years of experience with practically every TV and electronic component made in the last 20 years. All are installed with the same attention to detail as if you purchased them today from our company. Of course we stand behind every thing we sell or install. We're here to make sure your home theater experience is second to none!